The UHP-100 Broadband Satellite Router. UHP Networks Inc. has been selected by ABS to expand its VSAT technology — ABS has rolled out several UHP-based networks across Africa, Asia and the Pacific providing internet and VSAT connectivity and now plans to deploy new services in the Middle East. For the expansion of the ABS network, UHP Networks is supplying multiple high-density redundant UHP-HTS hubs and state-of-the-art UHP-100 remote routers. The UHP technology will provide a high-availability, bandwidth-efficient and cost-effective service to ABS customers. Tom Choi, the CEO of ABS. 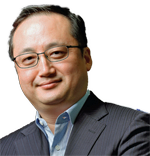 Tom Choi, CEO of ABS, said that his company has operated UHP technology in the ABS satellite networks for more than five years and have decided to expand the scope and the scale of our managed services further into the region. UHP network architecture is scalable and adaptable offering very cost effective solutions. Vagan Shakhgildian, CEO of UHP Networks, added that UHP technology delivers high availability and reliability, excellent bandwidth efficiency and superior processing capability over 100,000 packets per second in a remote terminal.